Britain’s in the midst of honoring the first year of WWI this year, but this monument is one of my favorite wartime memorials in London. A little vague, still deeply appreciated. A handbook was issued to American GIs stationed in Britain during WWII that cautioned them how to behave to British women. 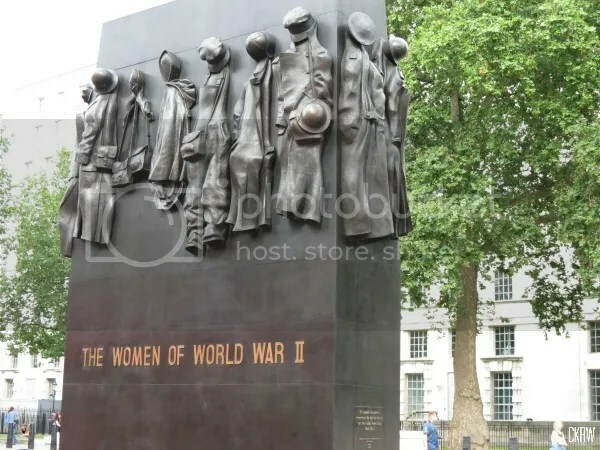 It pointed out how most of the women they encountered, whether in uniform or out, had been at war a lot longer than they had and had already sacrificed time, skills, labor, and lives to the cause. They had mobilized to grow food, work in factories, provide medical and military service, run businesses, protect communities, and perform critical work to keep the nation together. As such, the handbook stressed they deserved to be treated respectfully as comrades in arms. So say we all.